Vandy Vape's Kylin Mini RTA follows up on the critically acclaimed Kylin platform, presenting a postless build deck, an expandable tank capacity for all day range, all paired with a dynamic airflow system. The Kylin Mini RTA's ability to produce immense flavor and vapor production stems from its core, a gold plated postless build deck with 21 honeycomb style air channels and large wicking cutouts. The pair of centralized air channels brings airflow beneath the coils, while the outer channels direct airflow around the side and up towards the domed chimney. Additionally, the airflow is controllable via the three position airflow control ring and divided into two separate sides by a PEEK splitter. The Kylin Mini RTA comes as a 3ml compact tank system which is expandable to 5ml using the included bubble glass section. Vandy Vapes keeps the user in mind by integrating knurling on the adjustable airflow control ring, adjustable juice flow control ring, and on the removable top cap for filling for ease of use. Beautifully constructed, precision machined, and packing in the most intuitive and effective airflow systems across any atomizer today, Vandy Vape's Kylin Mini RTA enters the market as the premiere RTA of 2018 thus far. 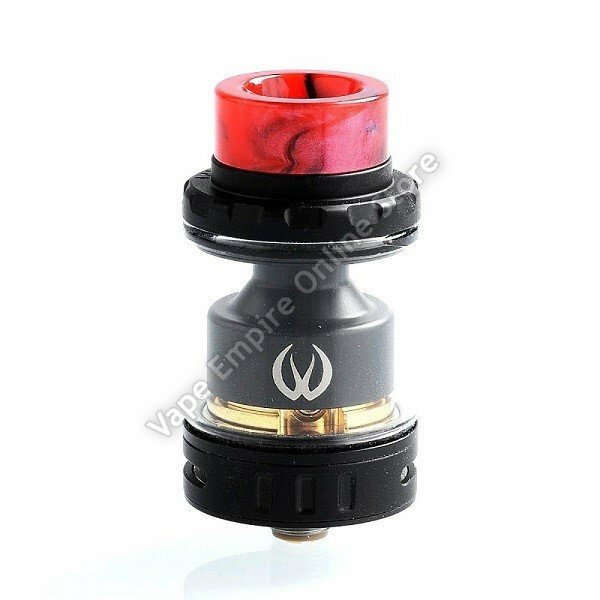 NOTE: Due to the nature of manufacturing and design, each Vandy Vape Kylin Mini Drip Tips features a unique colorway and patterning. Photos are for reference only and are not representative of the variances of each unit. Each unit will be sent out as packaged and at random.